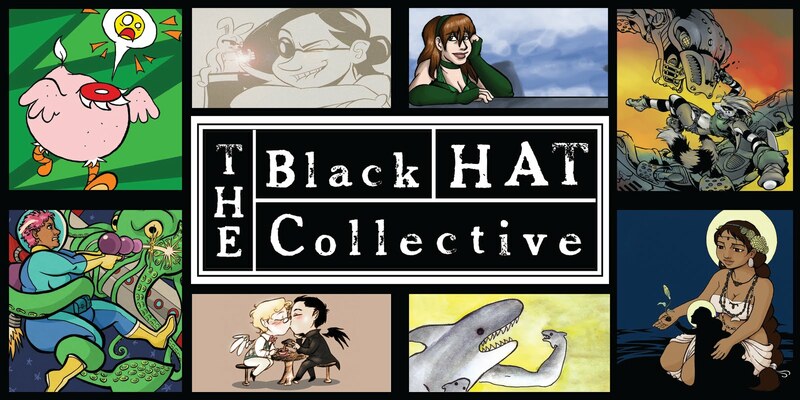 The GPS club the Black Hat Collective is a Twin Cities-based group of comics creators. We meet quarterly in February, May, August, and November on the 4th Saturday of the month from 1 pm to 5 pm at the Geek Partnership Society’s space in the Waterbury building. Black Hatters have been spotted representing our group’s work at MSP ComiCon, Anime Detour, CONvergence, and other local conventions. In 2007 we published our first anthology of short comics, Day in the Life. There’s a nasty rumor afoot that there’s another creative endeavor in the making. In the past, we’ve even had a comics artists’ Nite at the Opera in cooperation with the Minnesota Opera House. The resulting artwork had a gallery showing in Northeast Minneapolis at the Q.arma Building. Learn about the exhibition on Altered Esthetics. Please find our group on Blogspot. Due to the adult nature of some of the art, this club is 18+. If you are interested in more information or have questions, contact Black Hat Collective at blackhatcollective@geekpartnership.org.